Wedding - It is all you need to remember the most important day of your life forever. Then, Why not share this happy mood with your nearest people? You can and set the online project dedicated to your wedding day. For that, you can make a wedding website and share all the moments of your wedding. In this article, we have collected some best HTML wedding website templates. These templates will give you the full freedom to decorate your wedding website. These templates are perfect for using in wedding purposes such as wedding planner, wedding agency, invitation wedding page, personal wedding page, pre-wedding page, photography wedding page and more. It gives you everything you need for your ceremony. You can easily expose your story, team, service, pricing plan, images, and gallery on your website in an elegant way. It also offers Google Web Fonts, Newsletter, Contact Form, Social Media Integration, Google Contact Map, Slider, and many more. 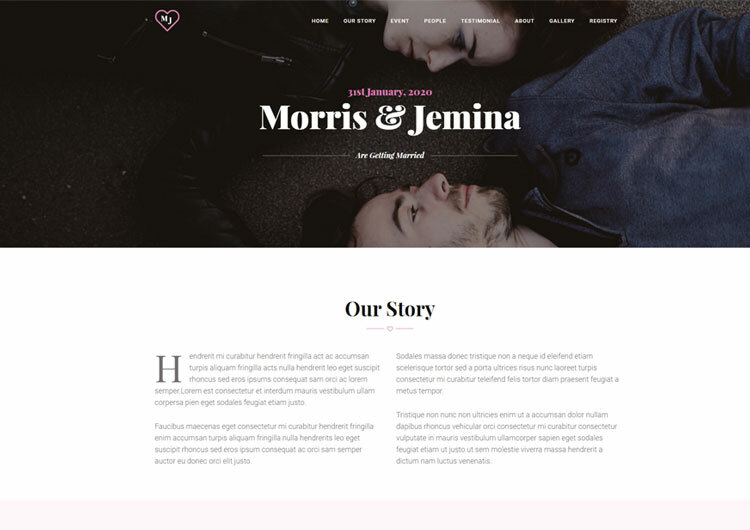 Letís check out this elegant and stylish wedding website template in great detail. Bootstrap 4 Template is an elegantly designed HTML template for Wedding Website, Wedding supplier, Event Management, Organizer and other wedding-related tasks. In all wedding website templates, you can get great elements like ñ Html5, jQuery, Css3, and Bootstrap v4.0, etc. The other things you will enjoy as an author are, easy customization, google font, clean markup, well documentation, W3 validate markup and enhanced functionalities. It looks great on mobile devices and desktops. In addition, 100% responsive layouts, cross-browser compatibility, slick slider, mind-blowing design, working contact form are satisfied and engage your visitors. Guarantee you are able, to create a gorgeous appearance with all the HTML wedding website templates.